Bounce or break? 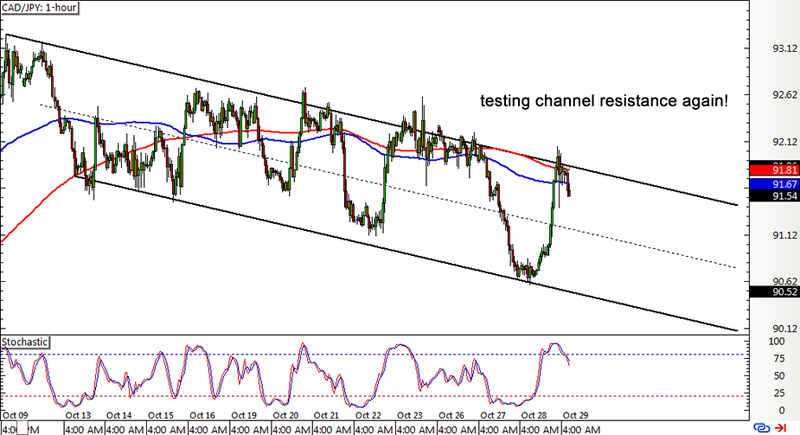 NZD/JPY has been trending higher and moving inside a rising channel on its 1-hour forex chart. Price is currently testing the bottom of the channel, still deciding whether to head right back up or to start a reversal. Stochastic seems to be pointing down, which suggests that Kiwi bears are ready to take control of price action and push the pair to the next potential floor near the 79.00 mark. However, the 100 SMA is still above the longer-term 200 SMA, which means that the uptrend might be able to resume and allow the pair to test the resistance near the 83.00 major psychological mark. If you’re hoping to short, better wait for a long red candlestick to close below those recent spikes around 80.25. But if you’re going long, a bounce above the short-term consolidation past 81.30 might serve as confirmation that Kiwi bulls are taking the lead. Speaking of bullish momentum, Guppy seems to be showing that it’s on a northbound route, as price already bounced off the ascending channel support on its 4-hour forex time frame. This could put the pair on track to test the channel resistance near the 186.50 to 187.00 area, although the mid-channel area of interest near the moving averages appears to have held as resistance. Aside from that, the 100 SMA is edging close to the 200 SMA, hinting that a downward crossover might be in the works. If so, GBP/JPY might make an attempt to break below the channel support at the 184.00 major psychological mark, especially since stochastic is turning down from the overbought region. 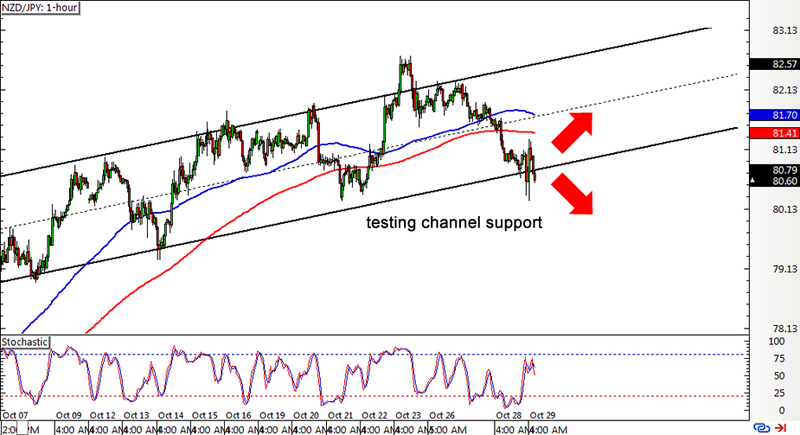 Last but definitely not least is this CAD/JPY channel that keeps on giving! The pair recently made a test of the descending channel resistance at the 92.00 major psychological level then plummeted down to the bottom, which held as strong support. This led to another bounce back up to the top, which seems to be holding as resistance yet again. After all, it lines up with the dynamic resistance area around the moving averages. The 100 SMA is still below the 200 SMA, indicating that the selloff is set to resume, while stochastic is crossing below the overbought area. 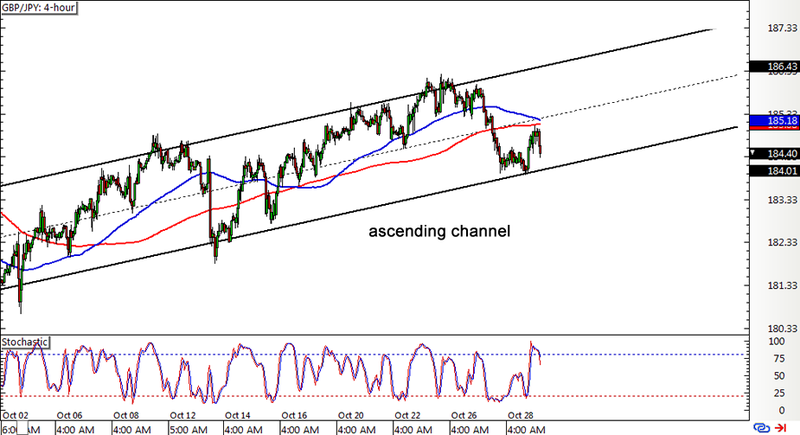 These support the idea that CAD/JPY has its sights set on the bottom of the channel at the 90.00 to 90.50 region. If you’re shorting at market, don’t forget to set your stop past the latest highs at 92.07!